A reader dropped me a line the other day, suggesting that I check out Annie M. Vicar’s Dolls and Skellery. I love it when people send me tips; they always suggest the coolest stuff. Vicar went to school for animation, but when she realized that she missed getting her hands dirty she turned to dolls to make her creations come to life. 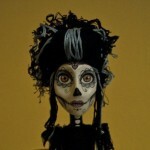 Her dolls and miniatures are all hand-sculpted and -painted, and their costumes are designed and sewn from scratch. The result is appealingly weird and evocative. You can see some of her past work on her site (she’s even got an absinthe fairy!) and in her Etsy shop. She will also do custom designs based on photographs or descriptions. Although there don’t appear to be any examples in her gallery, the site mentions that she also does wedding cake toppers; a custom piece featuring you and your intended could serve both as a cake topper and as a post-wedding piece of art. The dolls aren’t cheap, but one-of-a-kind items rarely are. One of them displayed in a bell jar would certainly be a striking focus for a room.